It must be the chilly start to winter. Or my dear friend, Alvin’s visit over Thanksgiving. Or the Christmas carols over the radio. But whatever it is I am starting to miss home. I have spent many Christmases away and this year will not be any different as Dennis, Stanford and I are spending Christmas in the city. But I still feel a little homesick when this time of the year comes. Christmas is huge back home, filled with traditions and brimming with Mom’s great food. Plus I particularly love the fact that the festivities are stretched two weeks out with more food and more presents over New Year’s and my birthday in January. As the youngest and the only boy in a family of eight, I fancied the lavish attention when I was growing up. To shake off the holidays blues, I decided to seek out food in the city that reminds me of home and make up a list of my own favorite Filipino comfort food. 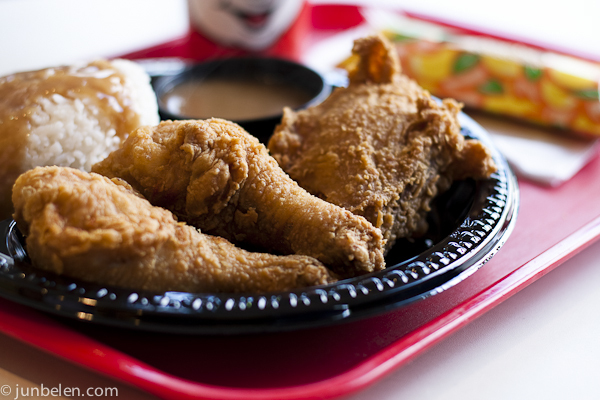 At the top of my list is a plateful of fresh, crispy, and juicy Jollibee Chickenjoy. Growing up back in Manila, a trip to Jollibee with my Mom and sisters was more than a treat, it was an event. My family wasn’t well-off and I certainly looked forward to the rare times when we would treat ourselves to fried chicken with rice, and french fries if we were lucky. My sister, Vangie, actually started her restaurant career at Jollibee. She would bring home goodies like burgers and fries every now and then and I would stay up late to wait for her when she worked the night shift. And when my sister, Liz, bought a tiny second-hand Toyota, we would cram five people and drive to pick Vangie up at Jollibee and get free vanilla and chocolate fudge sundaes on the way home. What an absolutely wonderful story Jun. Loved reading it. And learning about your Christmases in the Philippines. Hope you keep sharing these stories. Merry Christmas and a Happy New Year to you, Dennis and Standford!